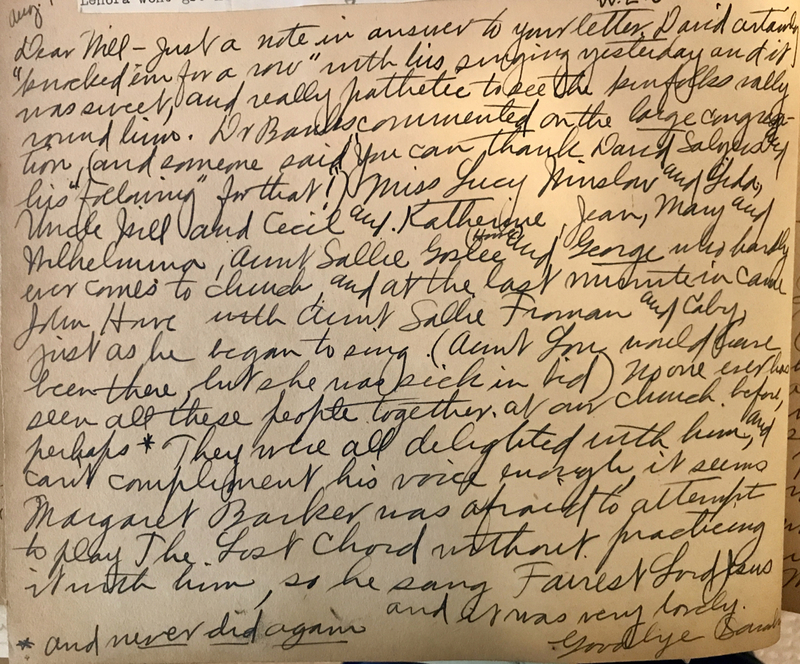 As we would expect, the scrapbooks Sarah Eva Howe Salyers put together in the 1930s reflect her family's activities and interests. The Howe-Salyers clan was interested in just about everything, so the scrapbooks are full of bits and pieces about this and that. The Salyers males participated in sports, all of them as fans and some of them as players. 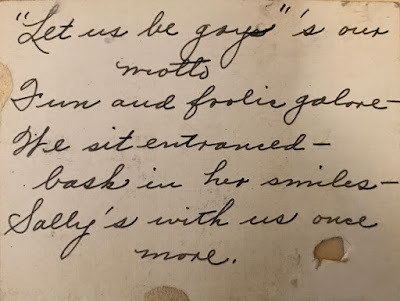 (I found proof in the letters they wrote to each other and in these bits of memorabilia in the scrapbooks. 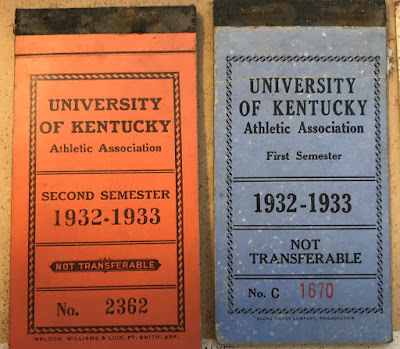 Students used books of tickets to attend UK athletic events. Fans who were not students could use this form to apply for reserved seats at home football games. 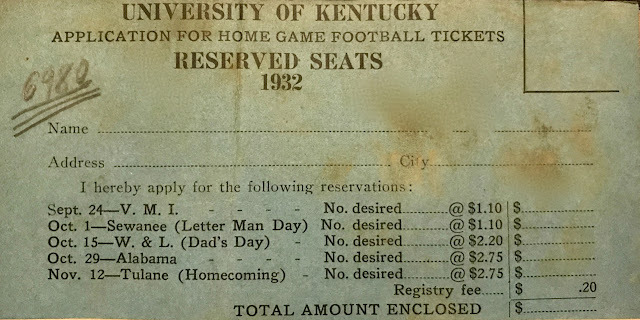 They would have paid a whopping $9.90 per person, plus the 20-cent fee, to attend all five games. I've heard family stories about Sarah's son Jim playing football and basketball and son David playing tennis, but I'm still looking for verification in the scrapbooks. If you've read posts about Sarah's childhood, you know that she, her parents, and her extended family paid close attention to political issues. Several of her relatives in Carrollton ran for public office. Her children continued the interest in local, state, and national politics. 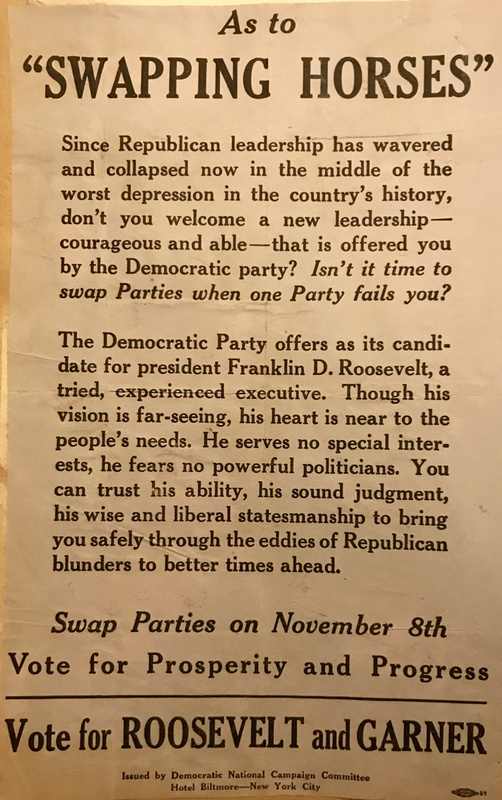 I rarely turn more than 10 pages in most scrapbooks before I come across a mention of political campaigns, platforms, speeches, or elections. These two items are from 1932. 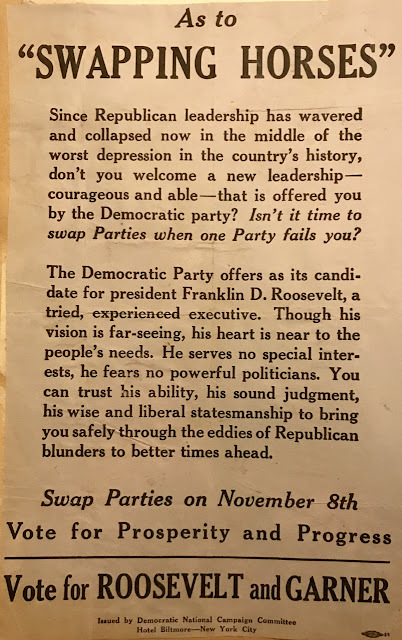 The first appears to be a clipping from a magazine (not identified in the scrapbook). I think the second is a leaflet. Sarah saved many ads. I don't know why she did that, but I'm glad she did. They provide insight into her life and times. Sarah did the household shopping, and I can picture her checking the grocery ads before venturing to the store. 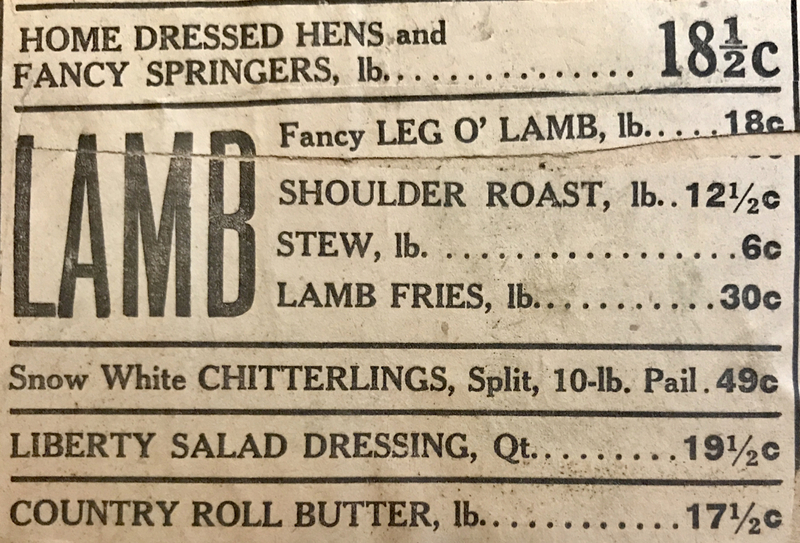 These prices seem low to us, of course, but consider that the average annual salary for those lucky enough to have jobs in Depression-era 1933 was (according to various online resources) about $1,370. Renting a 3-bedroom apartment cost $15 a month, on average. A gallon of gas cost about a dime. Also remember that in 1932-33 Sarah was buying groceries to feed a family of 3 adults, 2 college students, and one teen-age boy. 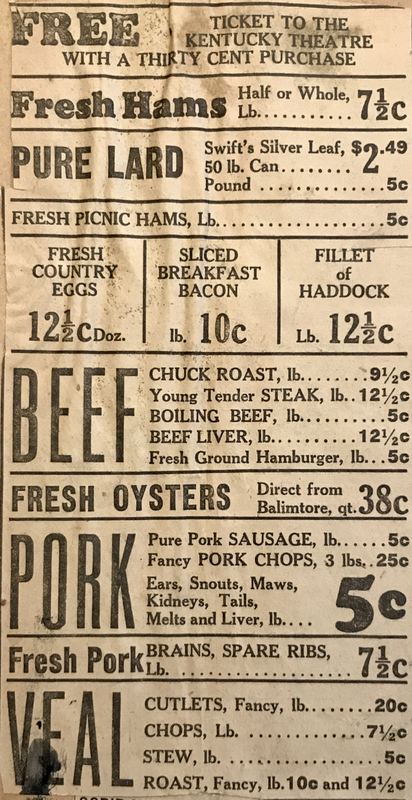 Notice the half-cent prices. The only references I've found to a U.S. half-penny say the coin was minted from 1793 to 1857. Maybe the half-cent amounts were totaled at the cash register and consolidated into the final price. Apparently, there was no half-penny coin, so I don't know how the clerk handled a single purchase priced with a half-cent amount. 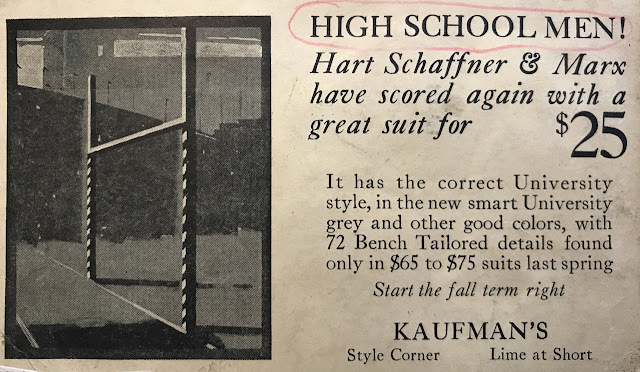 This is one of several ads for retailers marketing to high school boys and college men. In the 1930s (and until not so long ago), men wore suits to athletic events. The Kaufman's store in Lexington ran an ad in the early fall of 1932, offering a Hart Schaffner & Marx suit for $25. Sarah's husband William Levi Salyers and her son Robert King Salyers worked for the Moore company. Will's job was to find retailers who would display and sell Moore products in their stores. This ad is a sample he showed to prospective sellers. Note the "Your Name and Address Here" near the bottom, with a space for a retailer to promote his own store. 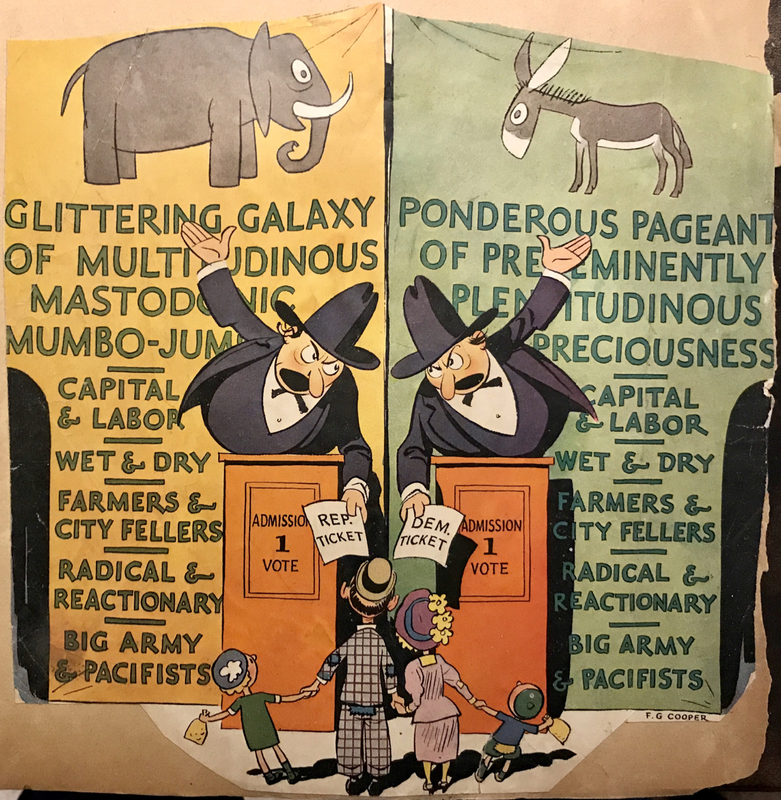 The item at left was on the same scrapbook page as several others advertising an event at the Kentucky Theatre in Lexington. The event brought several nationally-known radio stars to town to perform for a live audience. The event may have been broadcast live to the nation, but I'm hazy on that detail. The person in this ad appeared in small parts in a few Hollywood movies before he became a radio star at NBC. Jimmy Wallington was the announcer or master of ceremonies for several popular radio shows in the 1930s through the 1950s. The Salyers clan no doubt found radio programs both entertaining and informative. Sarah probably kept this clipping because she often heard Wallington's voice – and possibly because he was part of that event at the Kentucky Theatre. 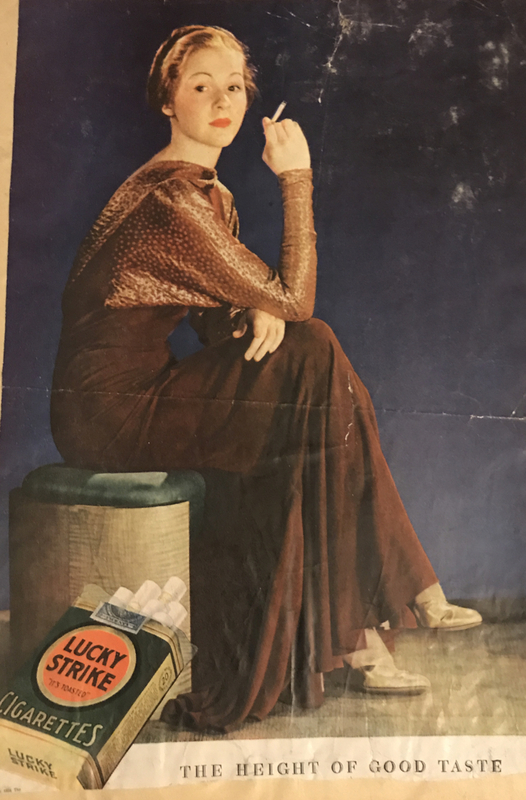 I speculate that Sarah saved the ad below not because of the product – I don't think she or her daughter ever smoked cigarettes and I saw her sons smoke only pipes and cigars – but because she liked the dress. Ultimate 1930s! Last but not least, this tribute to Groundhog Day. 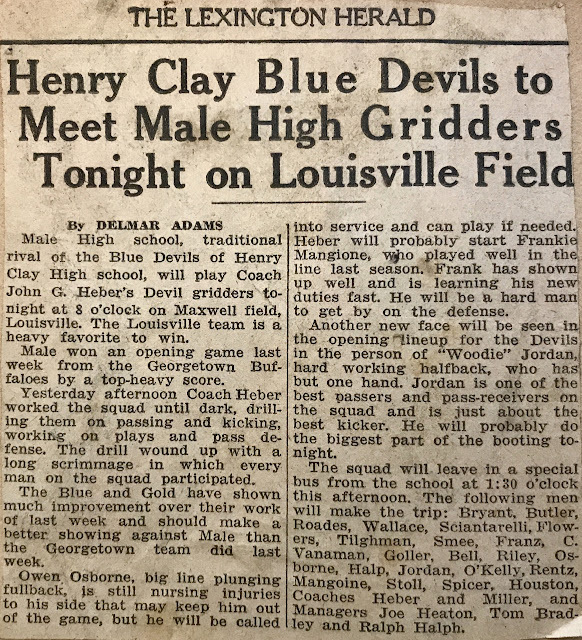 The item below is a newspaper article clipped from a newspaper, probably published in an afternoon paper, the Lexington Leader, on Feb. 2, 1932. 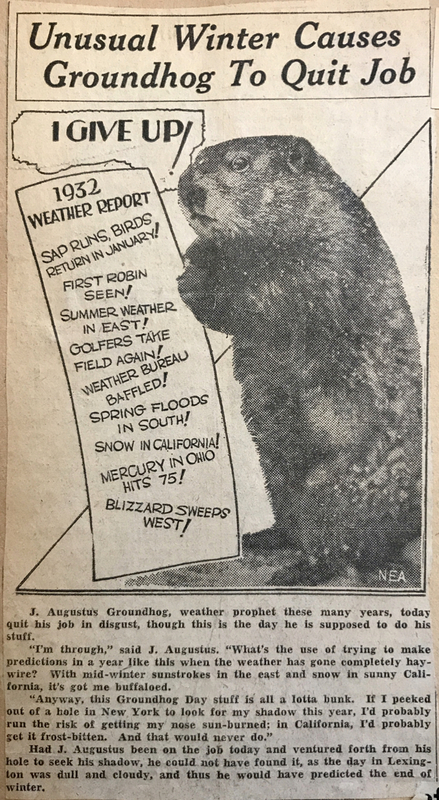 Based on current weather predictions, I'd say a groundhog who leaves his burrow in Lexington this Friday, Feb. 2, probably won't see his shadow. Will that mean the end of Winter 2018? We can only hope! Like most if not all families at that time, the family of Will and Sarah Howe Salyers had financial troubles in the mid-1930s Great Depression era. True, they fared better than many others, but they felt the effects nonetheless. Still, life went on, and The Salyers family made the most of it. Here are some examples of good times in the midst of troubles. Sally's with us once more. The trip must have been the tonic Sarah needed. I see no mention in the next few scrapbooks that she endured fatigue or headaches after her return. 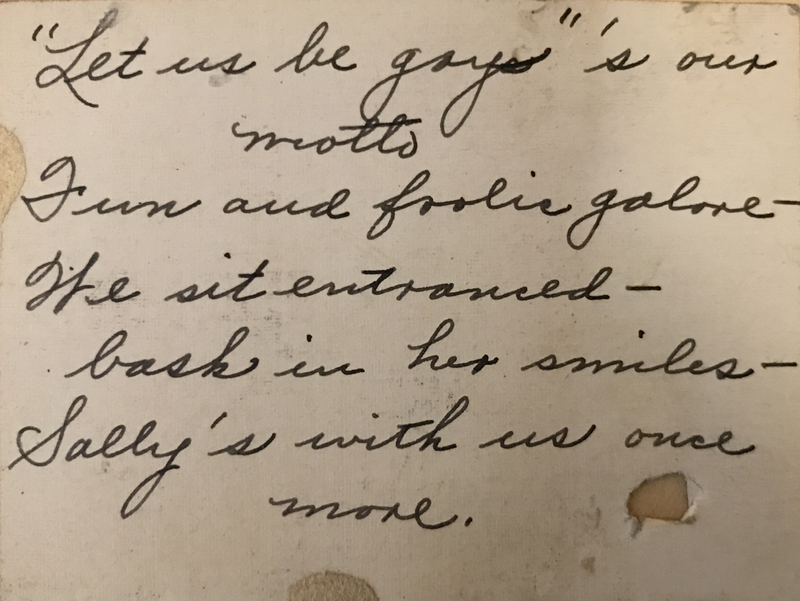 On a summer Sunday in 1933, Mary Alice's friends Virginia Nevins and Bill Shafer introduced her to a young man from Falmouth. His name was Lawrence Colvin. Lawrence was a farmer and beekeeper who sold honey. The scrapbooks include several letters Lawrence wrote to Mary Alice. 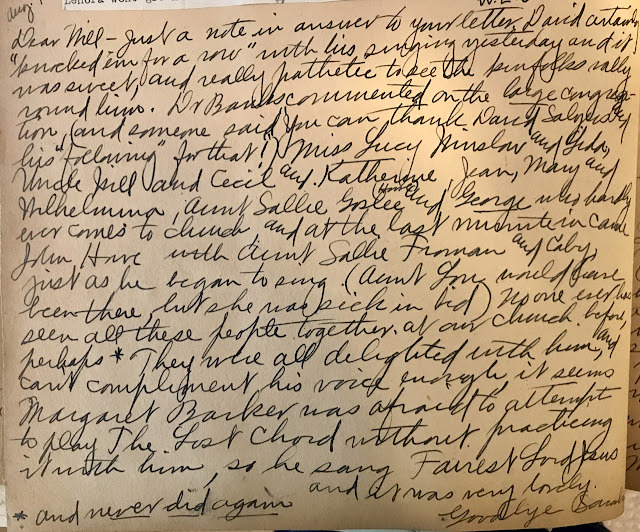 The letters are delightful to read and never end without compliments to the recipient and comments on the fun Lawrence had when he was with her. 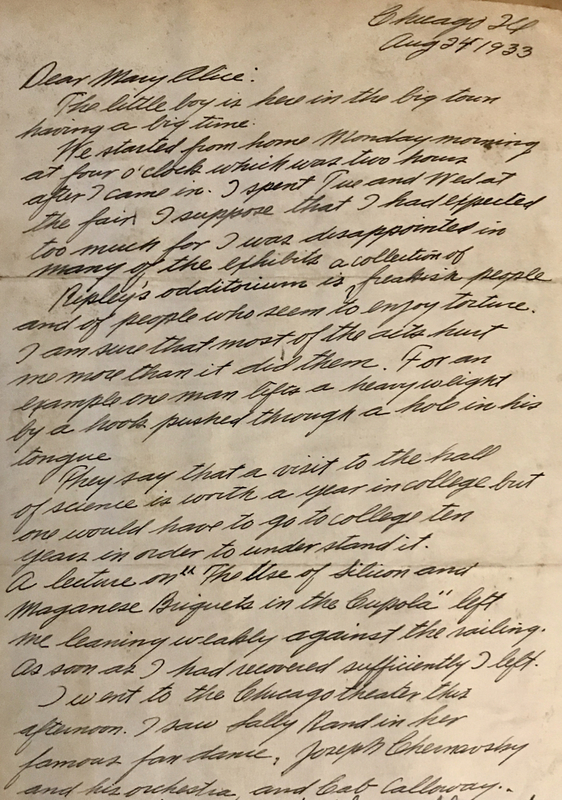 Lawrence sent this letter from the Chicago World's Fair, where he went with others to learn about the latest approaches in agriculture. I include it here because it offers insight into the life and times of the era. A partial transcription follows the image. I spent Tue[sday] and Wed[nesday] at the fair. I suppose that I had expected too much for I was disappointed in many of the exhibits. Ripley's Odditorium is a collection of freakish people and of people who seem to enjoy torture. I am sure that most of the acts hurt me more than it did them. For an example one man lifts a heavy weight by a hook pushed through a hole in his tongue. They say that a visit to the hall of science is worth a year in college but one would have to go to college twn years in order to understand it. A lecture on "The Use of Silicon and Maganese [sic] Briquets in the Cupola" left me leaning weakly against the railing. As soon as I had recovered sufficiently I left. I went to the Chicago Theater this afternoon. I saw Sally Rand in her famous fan dance, Joseph Chemavsky and his orchestra, and Cab Calloway." Lawrence went on to write that Calloway "leads his band with a vigourous manner dancing up and down the stage much of the time, and occasionally bursting forth in his famous 'hi-de-ho.'" 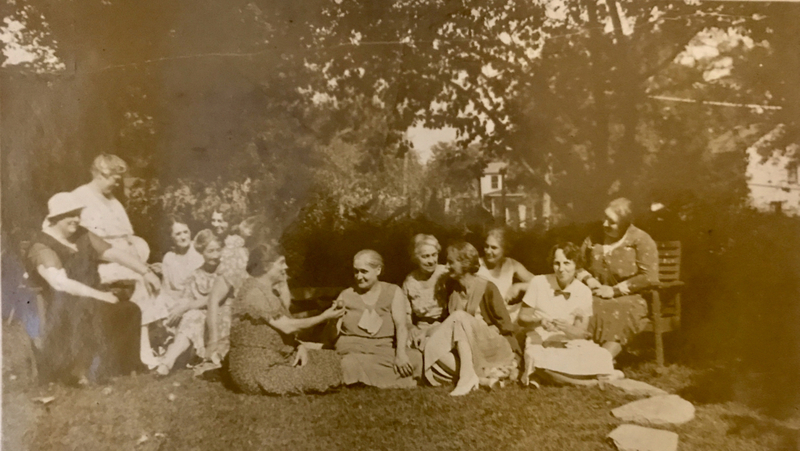 Music was a major form of entertainment for members of the Salyers family in the 1930s. Some of them played instruments, some of them sang, and all of them listened to music either on the radio or in live performances. The scrapbooks are full of references, and many of those references in the mid-1930s were about the youngest of Sarah's four children. David was known for his singing, both when he was a child in Carrollton and later in high school and college. A proud Sarah wrote to her husband (as usual, working out of town) about their son's performance at the Methodist church. A partial transcription, complete with Sarah's footnote, follows the image. The names she lists are Sarah's Carrollton relatives who traveled to Lexington for the performance. Dr. Banks [the pastor] commented on the large congregation (and someone said 'You can thank David Salyers and his following for that!"). Miss Lucy Winslow and Lida, Uncle Will and Cecil and Katherine Howe, Jean, Mary and Wilhelmina, Aunt Sallie Goslee and George who hardly ever comes to church, and at the last minute in came John Howe with Aunt Sallie Froman and Caby, just as [David] began to sing. . . . No one ever has seen all these people together at our church before, perhaps. * They were all delighted with him and can't compliment his voice enough, it seems. David and his voice were in high demand. He sang at weddings, funerals, and other special occasions, and he performed in many stage productions, both at Henry Clay High School and at the University of Kentucky. 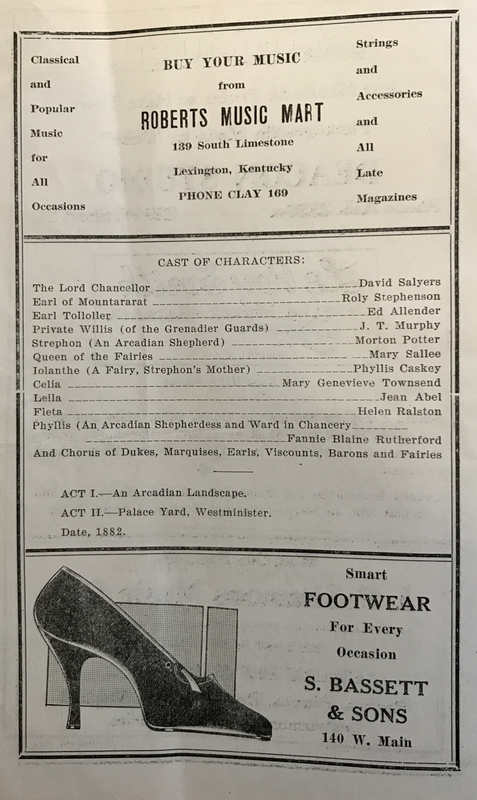 A page in this event program from February 1933 lists David as the lead in "Iolanthe," a Gilbert and Sullivan opera staged by Henry Clay High School. 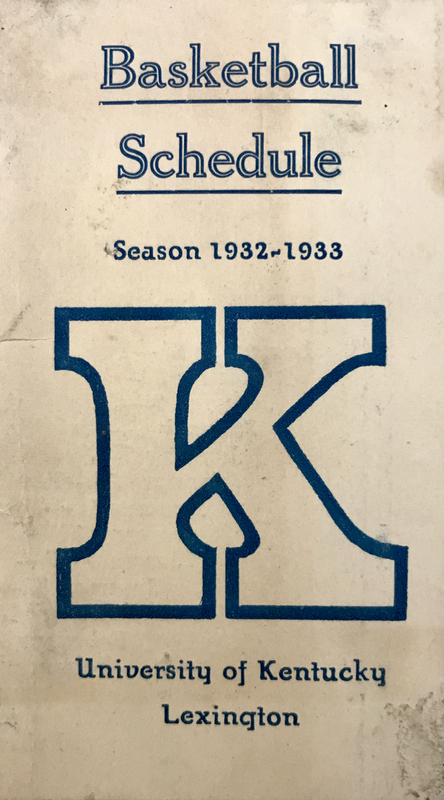 The scrapbooks for the 1930s are full of programs from musical events at the University of Kentucky, Lexington churches and auditoriums, and other locations. There are also many clippings about movies that played at the Kentucky, the Grand, and other Lexington theaters. 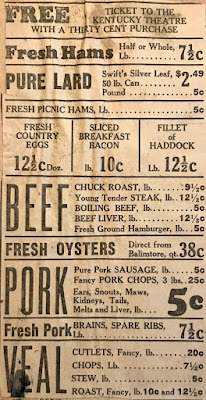 I don't know how many movies the Salyers family members attended, because the 25-cent admission was more than the cost of a hot meal in a local cafeteria. 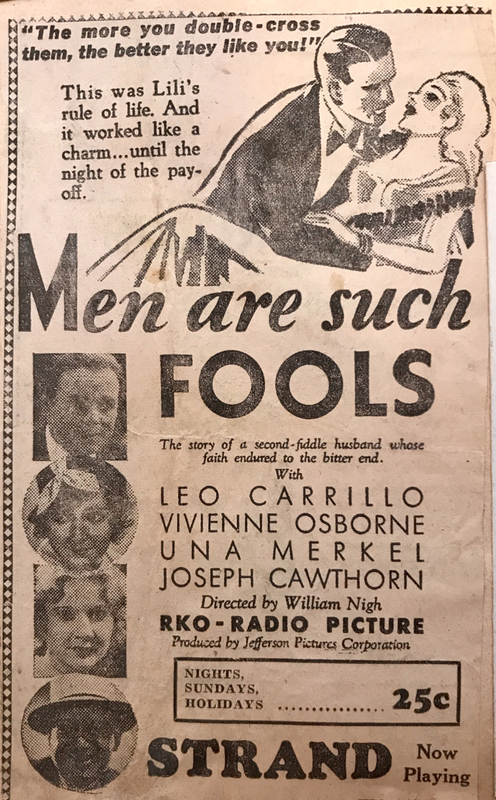 Still, ads like this one for a 1932 production are fun to see. 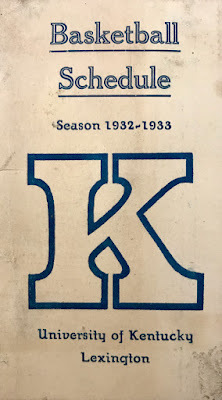 Over the next few posts, we'll explore more about the 1930s in Carrollton, Lexington, and other places in Kentucky. Depression or no Depression, those were lively times! 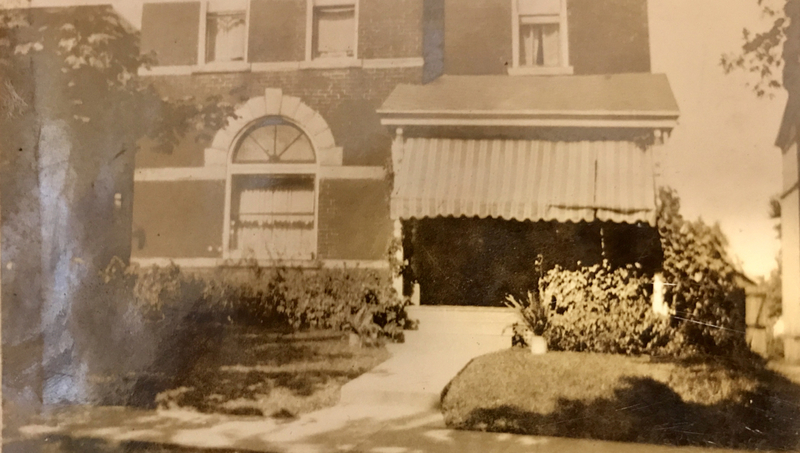 In 1933, Sarah Eva Howe Salyers and her family were living in Lexington. 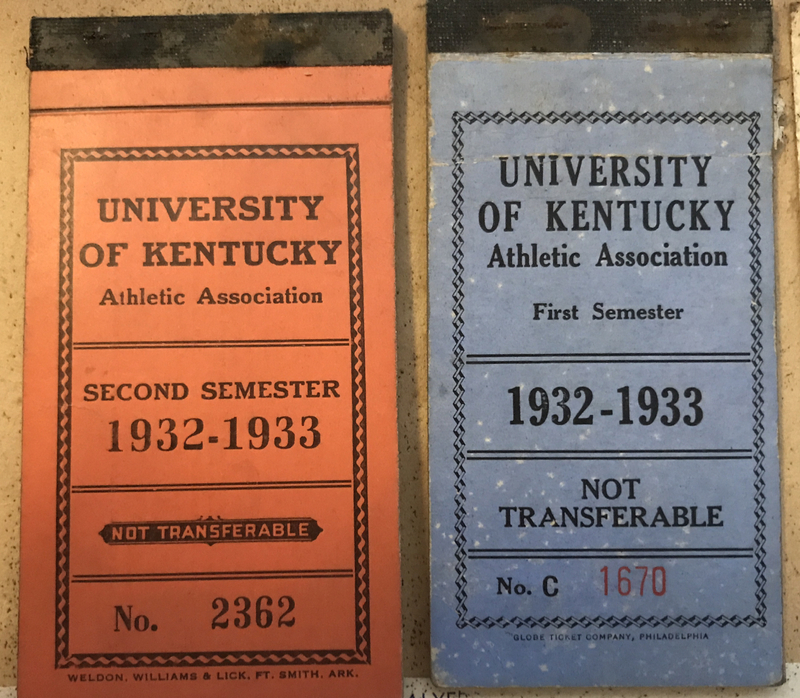 They had moved there from Carrollton a few years before, when their older children enrolled at Eastern Kentucky State College and the University of Kentucky. 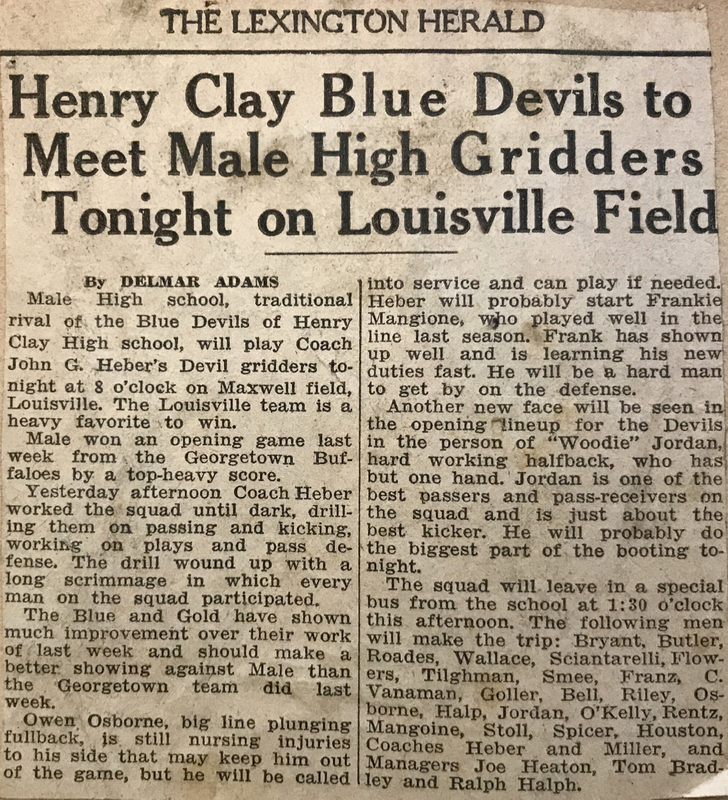 Their youngest, David, was still in high school and on June 1, 1933 would graduate from Henry Clay High – one day before his brother Jim would graduate from UK. The eldest, Bob, already had his college degree and was working for the Kentucky Education Association. Sarah's only daughter, Mary Alice, had earned a bachelor's degree at Eastern and in 1933 enrolled in a UK summer course toward earning a master's degree. 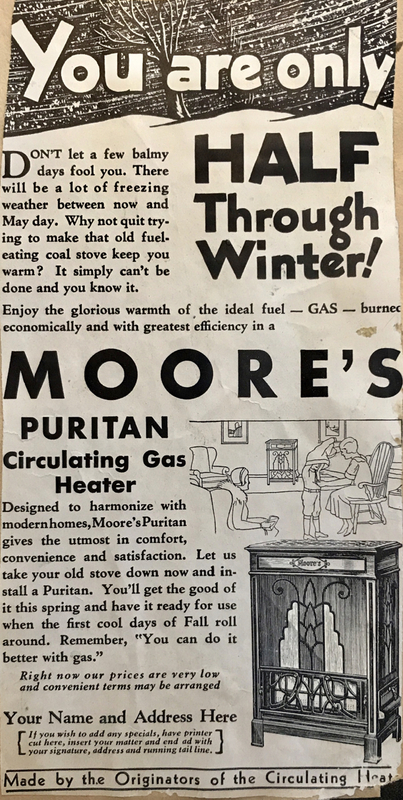 Sarah's husband, William Levi Salyers, still worked for The Moore Corporation, a stove and furnace distributor based in Joliet, Illinois. "The Great Depression lasted from 1929 to 1939, and was the worst economic downturn in the history of the industrialized world. It began after the stock market crash of October 1929, which sent Wall Street into a panic and wiped out millions of investors. Over the next several years, consumer spending and investment dropped, causing steep declines in industrial output and employment as failing companies laid off workers. By 1933, when the Great Depression reached its lowest point, some 15 million Americans were unemployed and nearly half the country’s banks had failed." Will, who travels regionally representing the Moore Corporation, writes home to request money or sends a little money to Sarah – sometimes as little as $2 – to "tide her over" or to "cover some basics." He writes checks knowing that money may not be in the bank to cover them. In letters to Sarah, he refers a time or two to "this depression" and expresses frustration at not earning more. Sarah, either on her own or at Will's suggestion, delays purchases. She pays some bills and not others. Like other homemakers in 1933, she "makes do" and gets creative to meet basic needs. The three adult children work full-time or part-time to support themselves and contribute to the household. Letters refer to finding deals on second-hand clothing, being unable to pay for car repairs, borrowing money and clothing from each other and from friends, and looking for work without success. David, probably at the suggestion of one of his parents or brothers, approaches a relative in Carrollton for money to help with college fees for his freshman year at UK. 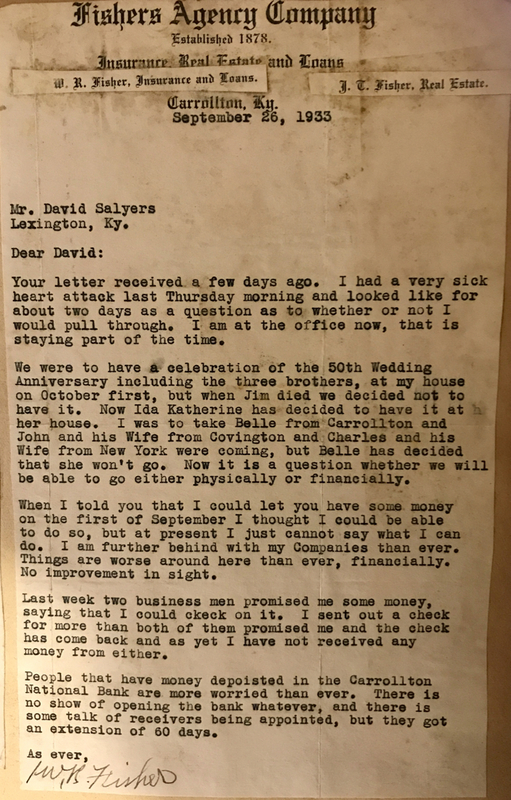 The relative promises to provide some money, and there are notes and letters indicating that David made at least one trip to Carrollton to collect the cash. The relative postponed the gift (or loan?) a time or two and in late September sends regrets that he cannot honor the promise. His letter also mentions troubles at the Carrollton National Bank. Through it all, the family continues to put education first. (This isn't surprising, if you recall the importance Sarah's parents, grandparents, aunts, and uncles placed on learning.) The scrapbooks contain no hints that any of the children ever considered dropping out of school. Somehow tuitions and fees are paid, and by the end of the Depression, all four earned at least a bachelor's degree. 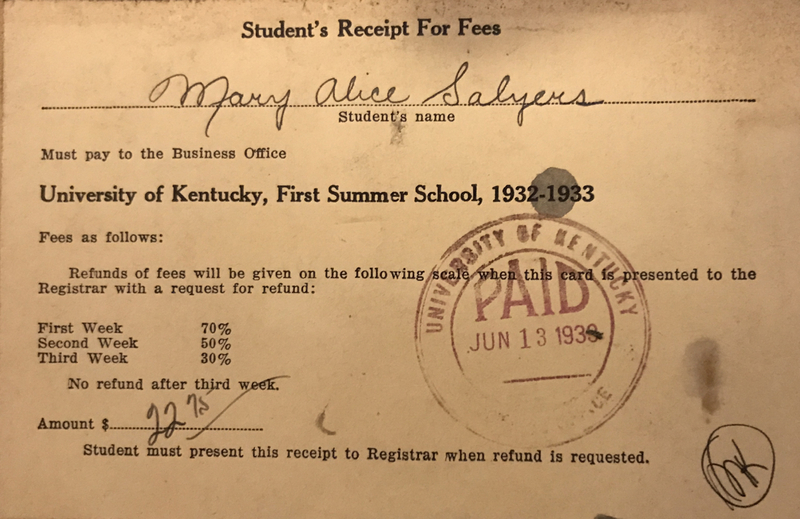 Of course, the college fees in 1933 seem ridiculously inexpensive today, but the $22.75 Mary Alice paid for a summer course at UK was more than two-thirds of the $30 her family was paying in rent every month. The college fee she paid that summer would equal about $420 today. 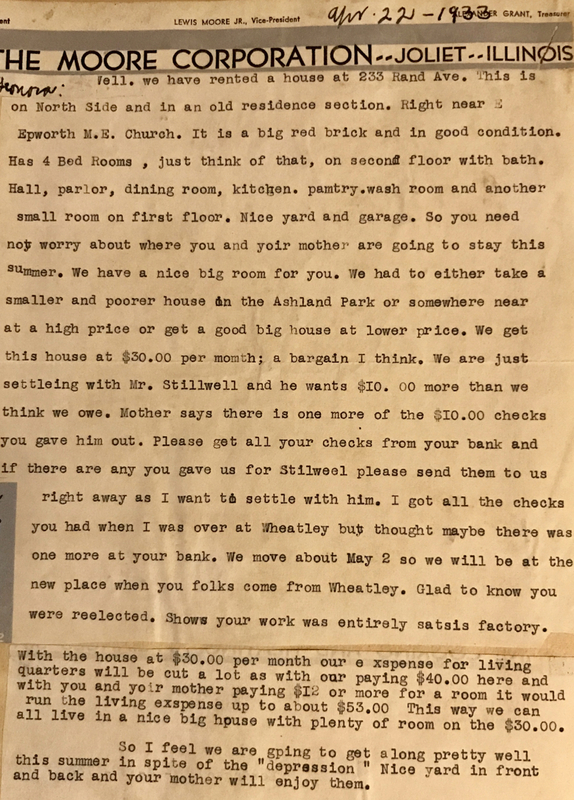 In April 1933, a letter from Will informs Sarah's sister Leonora that the family is moving to a less-expensive house on Rand Avenue in Lexington. He mentions quibbling with his current landlord over $10 and asks her about checks he apparently expects to receive from her or her mother to settle with the landlord. Apparently, Leonora, who is single, and her mother, a widow, do not live in a home of their own but stay with various relatives and friends for weeks or months at a time before moving on to the next stop. The reference to Wheatley refers to a community in Owen County, about 16 miles southeast of Carrollton. No doubt they stayed with relatives or close friends there, although I have not yet discovered the names of those hosts. During The Great Depression, combining households was a common approach to getting by financially. The scrapbooks have references to Leonora and her mother contributing to household costs wherever they stayed. 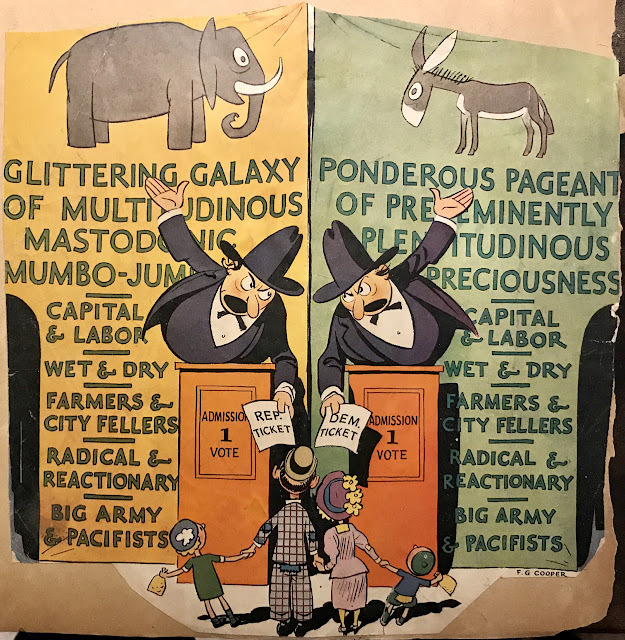 According to the web page U.S. History in Context – Everyday Life 1929-1941, a family living on an annual wage of $1,000 to $2,500 in the mid-1930s was in the middle class. Only 12 percent of American families in those days fit into that category. 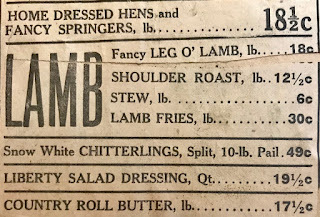 I don't know what the Salyers family income was, but – based on what I read in the scrapbooks – I suspect they may have been at the low end of the middle-class range, even counting multiple incomes. I marvel about their determination to "keep up appearances" and to pay for college for all four offspring. As the economic depression deepened in the early 30s, . . . banks began to fail at alarming rates. During the 20s, there was an average of 70 banks failing each year nationally. After the crash during the first 10 months of 1930, 744 banks failed – 10 times as many. In all, 9,000 banks failed during the decade of the 30s. It's estimated that 4,000 banks failed during the one year of 1933 alone. 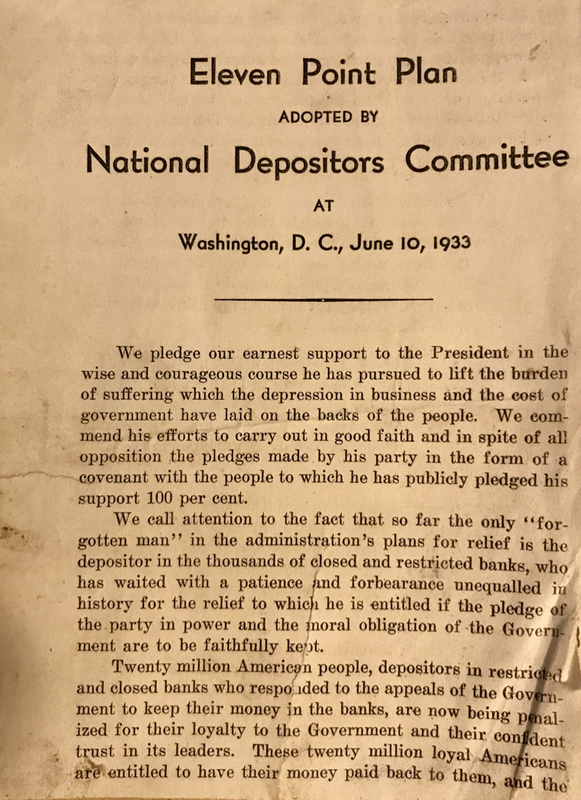 By 1933, depositors saw $140 billion disappear through bank failures. 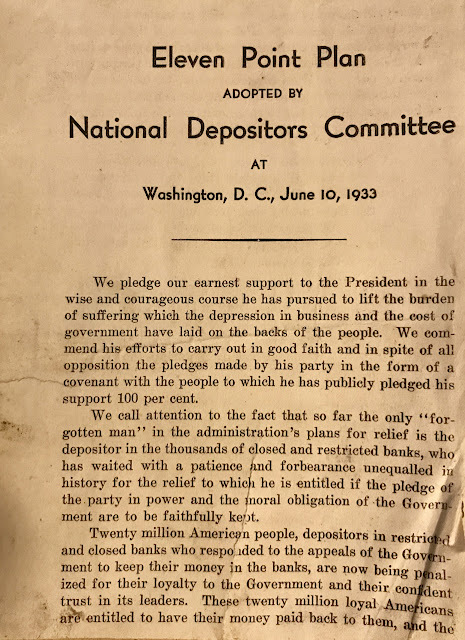 This front page of a pamphlet pasted into one of Sarah's scrapbooks tells us the thinking of the National Depositors Committee, formed to speak for Americans who lost money when banks were closed. In his letter to young David Salyers, Mr. Fisher sounds worried that the Carrollton National Bank, founded in 1881, might not re-open for business. Apparently, the bank survived. There is a bank called First National Bank of Kentucky (previously called First National Bank of Carrollton) in the town today. I don't know if the Salyers family lost deposits during the Depression, but the scrapbooks make it obvious that they struggled financially. Still, all was not gloom and doom. In the next post, we'll look at some happier aspects of the family's life in 1933. © Frances Nelson Salyers. Picture Window theme. Powered by Blogger.